Each day this week, we'll be looking at a card that touches on some part of Dominarian history. 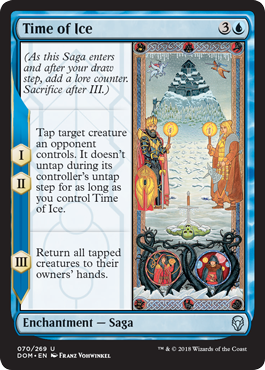 We'll talk a bit about that history, show off the art, and discuss the flavor text. When we discuss the place in Dominarian history, we'll be using years before and after the Argivian Reckoning (AR), kind of like how we use BC and AD in the real world. Today we'll be looking at Time of Ice. There is a ton packed into the art on this one, so let's look at what's going on—right after looking at that art in a larger size. The main setting is a Kjeldoran outpost, the site of a massive battle between knights and zombies. On either side of that scene are two central characters from the Ice Age block (which included Ice Age, Alliances, and Coldsnap), King Darien (left) and Lovisa Coldeyes (right). At the bottom of the frame are two other key figures in the Ice Age—Jaya Ballard (left) and Jodah (right, looking all mysterious). And those tentacles wrapped around them? For once, yes, it is actually Marit Lage. Finally, at the top you can see a knight riding a white pegasus and another knight riding an aesthir and holding a lance. The art description doesn't pair them directly, but they're pretty much dead ringers for White Shield Crusader and Kjeldoran Skyknight, respectively. Okay, so that's what everything is, but if you weren't playing during Ice Age (I myself started then, and I've been around for a loooooong time) or aren't neck-deep in lore, then those names may not mean a ton. The Ice Age covered a number of events over thousands of years, lasting approximately 450 AR to 2934 AR (64 AR was when the cooling started, but 450 AR is the hard date of the start of the Ice Age). In 2934 AR, Freyalise cast the World Spell that broke the Ice Age (and had a bunch of other effects we won't get into here). That's the big-picture context. Next up is what this art is depicting specifically. Let's start with Jaya and Jodah. Jaya was a child during the Ice Age and was caught stealing by Jodah. Jodah, instead of punishing her, taught her about magic. She set off on her own, reunited with Jodah long enough to defeat Lim-Dûl the necromancer, then had her mind taken over by Mairsil. Jodah freed Jaya's mind, which actually awakened her Planeswalker spark. Darien was king of Kjeldor (not to be confused with its capital, Kjeld) in 2934, when the Ice Age ended. He and Lovisa—who was the leader of the Balduvians—put aside their differences to ally (get it, Alliances?) against the necromancer Lim-Dûl, which is the battle you see depicted on this card. Eventually, Darien and Lovisa merged their two nations into New Argive, but that was decades after the world had already begun to thaw from, say it with me now, the Time of Ice.